THE SHOW WHERE YOU DON'T GO ANYWHERE BUT YOUR MIND DOES! 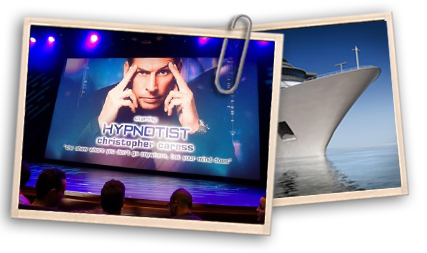 Christopher Caress is respected all over the world as an elegant and powerful hypnotic global entertainer. Christopher’s performance makes him the first choice when you are looking for outstanding professional entertainment. If you are an organization or individual looking for a unique special event with a difference then look no further Christopher Caress should be top of your list. Christopher has performed at some of the most exclusive parties and high-powered corporate functions in the world, recently Christopher gave a Royal Command performance for the Prince of Dubai in the grounds of the Royal Palace. Christopher presents a triumph of imagination, suspense and science that demonstrates why stage hypnosis is fast becoming the most sought after corporate entertainment around today. Each show that Christopher performs at has specifically been written, tailored and choreographed to suit your exact requirements. and making any occasion an unforgettable event. and size of the event. © Christopher Caress Hypnotist. All Rights Reserved. Website by Headfudge Design Ltd.